After testing out an expanded 280 character limit for tweets among selected users over the last month, Twitter has now confirmed that 280 character tweets will be made available to all users (though Japanese, Korean and Chinese language tweets will maintain the 140 character limit). The longer form of tweets have received a mixed reception, but Twitter has somewhat self-consciously justified the expanded roll-out with a new set of data and research methodology points to help underline why they’re doing so. First and foremost, Twitter says that users are engaging with the longer tweets more. As shown in this graph, longer tweets are generating more likes than shorter ones. Twitter also says the longer text option has alleviated a key problem - that users regularly run into the length limit. Twitter says this demonstrates that having more characters makes it easier for people fit what they want to say into a tweet, rather than cutting down their thoughts - which, in turn, leads to them tweeting more often. As noted, the whole announcement is very self-conscious, with Twitter moving to reassure concerned users that everything’s going to be fine – better than ever, even. In another section of the research, Twitter says that tweet presentation will not be significantly impacted by longer tweets flowing through – in the test period, the number of tweets people saw on their screen at any one time was only affected by 0.3%. Personally, I’m not sold on 240 character tweets. 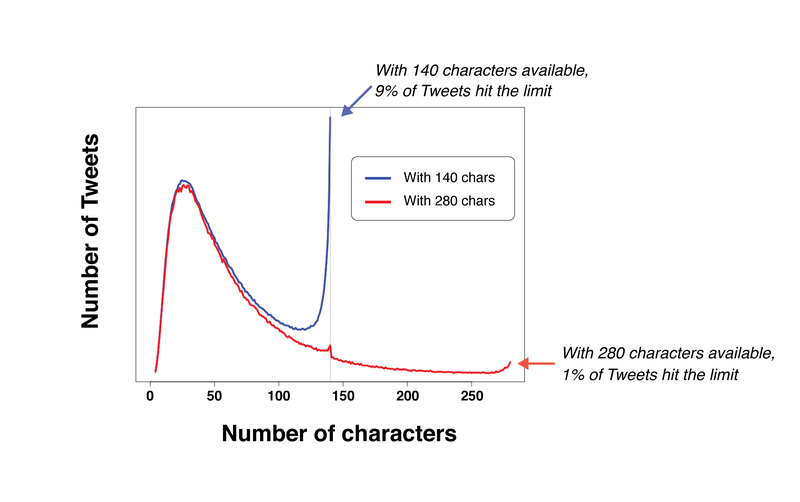 In my recent Twitter predictions post, I noted that I wouldn’t be surprised if Twitter reversed course with 280 characters, but the final decision, of course, will be told in the data. If more people tweet more often as a result of having more characters – which Twitter is now saying they are – then they’ll keep it. But then again, the data points here are somewhat skewed by the small sample size of the initial test – sure, timelines were only altered by 0.3%, but what percentage of users actually had access to longer tweets? You can bet those figures will change when everyone can use them. Concerns aside, the data presented does show promise, and as reflected in Twitter’s performance reports, they need to do new things, try new initiatives, in order to stimulate growth. A key note of Twitter’s messaging is that the mis-use of the longer limit, where people were posting deliberately expanded messages, is only due to novelty, and that will wear off, normalizing into the behaviour they’ve recorded above. Whether that’s true on a broader scale, we’ll have to wait and see, as we will for the wider usage data which will tell the true tale of how valuable the option is. NOTE: As clarified by Marketing Land, advertisers won’t be able to use the new tweet length for ads created through Twitter’s self-serve platform (at least not initially), but brands will be able to post 280-character-long organic tweets and run those as Promoted Tweets.